When I first saw the stylish paper artichokes created by Noemi Hicks of Imeon Design, the memory of eating one came back in a pleasant rush. Perhaps you've seen similarly constructed pinecone ornaments at holiday time. Noemi has literally turned the design upside down, transforming it into a place setting marker that doubles as a unique party favor. 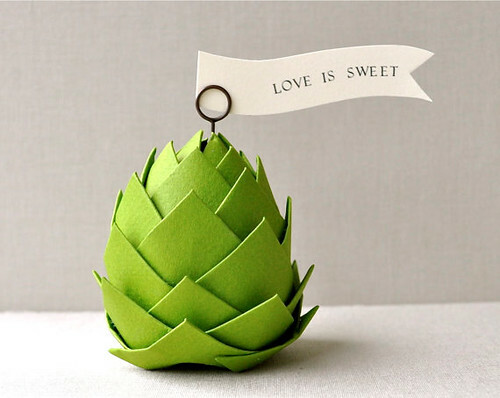 A guest can display it as is or switch the pin to the other end, add a ribbon, and hang the artichoke as a Christmas tree decoration. Noemi credits a sister-in-law who believed she had talent and an eye for design as the reason for opening her shop, Imeon Design. She's drawn to clean lines and simplicity, no doubt influenced by her architect dad. Have a lovely weekend everyone... btw, the I ♥ Stationery giveaway ends on Sunday. I hope you'll win! This is so cute and perfectly folded. haha Leslie, exactly! I'm so glad someone else out there in blogland can relate to my artichoke love. It's funny, I think I've only bought fresh ones once in my adult life... I really should do it more often. I guess my mom was a rebel back in the day, as she was always preparing the more obscure vegetables. I've only ever eating artichokes as an exchange student in France with my host family. They struck me as tasting rather like cardboard but maybe it was because there was no lemon butter. The paper one is lovely, though! ohhhh!! i follow her on twitter and have always thought it was a green pinecone. but duh! it looks exactly like an artichoke! they are pretty delish. i love the multipurposeness of this guy. makes it even more adorable.